If you are “upside down” on your auto loan, your car is worth less than what you still owe on it, and your car is totaled, you may have to continue making loan payments on a vehicle you no longer can drive. There’s a special type of protection called GAP (guaranteed asset protection) coverage designed to cover situations like this. GAP coverage is a debt cancellation agreement. It waives the section of your financing agreement that holds you responsible for the difference between the value of your totaled car and your remaining loan balance. This coverage satisfies your liability to pay the gap. As more buyers put little or no money down, roll an unpaid balance on an old auto loan into a new auto loan, or take out an extended-term loan of 60 months or longer, the need for GAP coverage is increasing. Call us at 800-255-0886 for more information about GAP coverage today. ISPFCU is committed to providing a website that is accessible to the widest possible audience in accordance with ADA standards and guidelines. If you are using a screen reader or other auxiliary aid and are having problems using this website, please contact us at 800-255-0886. 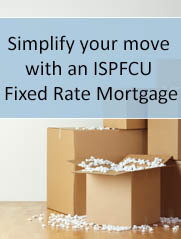 All products and services available on this website are available at the ISPFCU branch.